Complete nephrectomy, which removes the cancerous kidney fully, or partial nephrectomy, which removes a section of kidney. Just the tumors can be surgically removed. The tumors can be destroyed through a method called ablation, which uses a probe guided by CT scan to either burn or freeze the tumor off. At UCSF, an outcome-focused commitment across departments will often result in a combination of these approaches. “We may practice in different fields, but when it comes to treating our patients, we have a unique means of sharing insights across disciplines,” said Dr. Kirsten Greene, a UCSF urologist who has been working with interventional radiology on kidney tumor ablation since the program started in 2008. “Rather than advocating our own specialties, we look out for the interest of the patient. “Sometimes, when a patient has cancer in both kidneys, one kidney needs to be removed, but the other may have a smaller tumor. In that situation, I’ll partner with the interventional radiologist, my colleague Dr. Zagoria. He has performed thousands of successful ablations. Dr. Zagoria can ablate the smaller tumor, and I can remove the kidney with more cancer. The two of us together get rid of the cancer — and we save a kidney, which prevents the patient from having to undergo dialysis. That’s the level of outcome we’re aiming for. It’s not about surgery versus ablation, or urology versus imaging, it’s about assembling the best lineup of resources for the patient. “Because UCSF is a research institution and we treat patients, we are uniquely positioned to bring everything together for patients. That makes us all challenge ourselves to track results every day to insure we have a growing body of experience to reference for each and every patient. We daily gather data from our own procedures, from our world-class colleagues, and from translational research. In this way, we have the opportunity to individualize treatment for patients based on the best information and techniques available. “But our efforts don’t stop with technical consideration. Providing the best treatment options means that we also ensure that we understand the patient from a holistic standpoint. Once we consider kidney tumor ablation as an option, the medical team then considers what’s best for the patient’s lifestyle. Kirsten Greene received her undergraduate degree from the University of Virginia in Interdisciplinary Studies on full academic scholarship. She received her MD from the Johns Hopkins University School of Medicine in May 2000. She then completed her general surgery and urology training at the University of California, San Francisco where she was inducted into the Alpha Omega Alpha Honor Society and received the House Staff Teaching award in 2003. Greene is combining her interest in urologic oncology, minimally invasive surgery and outcomes research by completing a master’s degree in clinical research as she continues as UCSF faculty specializing in urologic cancers and laparoscopy. 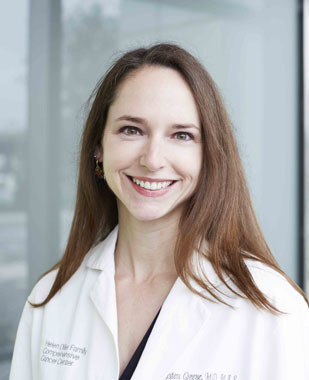 She is part of the multidisciplinary urologic oncology team of the UCSF Helen Diller Family Comprehensive Cancer Center located at the Mount Zion Medical Center and also operates at the Veterans Affairs Medical Center and San Francisco General Hospital. — Originally posted on UCSF here.